WHEELING — They might be small, but they’re also mighty. 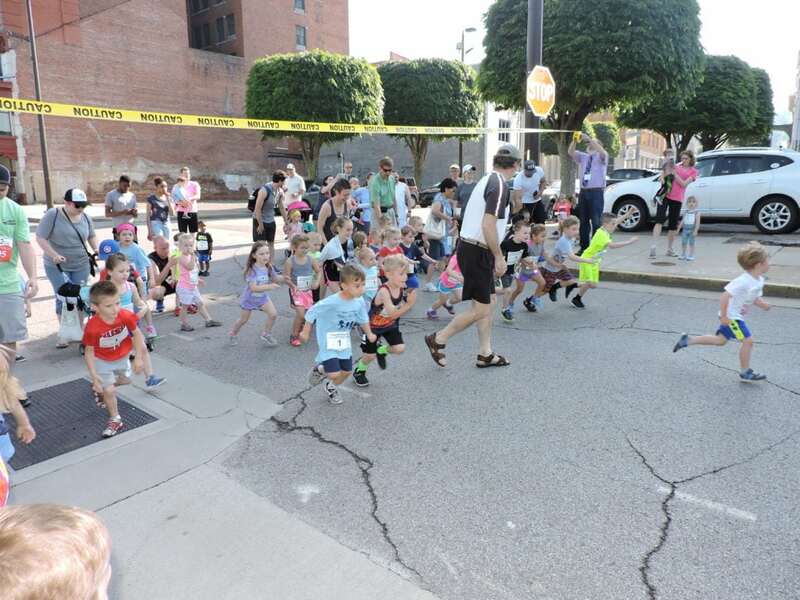 The Ogden Newspapers Half Marathon Classic’s smallest — and cutest — racers took to Water Street on Saturday for the annual Ogden Tiny Tot Trot. The non-competive race is a 100-yard-dash for children 5 years old and younger. The 5-year-olds took off first, while the second heat was reserved for those 4 years old and younger. Martins Ferry residents Terrie and Harry Wright, grandparents to 3-year-old Armoni Ray, brought Armoni to the race while his mother, Amy Wright, was at work. Mount Olivet resident Josh Smith brought his 2-year-old daughter Aurora Smith to the trot. He said his wife, Susan, was doing the 5K run. “We thought this was a good opportunity to introduce Miss Aurora to running,” Smith said of her first try at the Tot Trot. Aurora agreed that she enjoyed running. Weirton resident Brandy Dorsch brought her 4-year-old son Balin to the Tot Trot while her husband, Dan Dorsch, participated in one of the walks. “He wanted to be like daddy and get a medal,” Brandy Dorsch said of Balin’s plan to trot. At the finish line, the trotters were all given a medal for participating. Each of their race bibs had a No. 1 on them. Greeting them at the finish line and passing out the medals were members of West Virginia University’s Dance Team Morgan Pitcher, Grace Myers and Caton Kadylac.